Aim: The cooperation between non-governmental organizations and public administrative bodies exemplifies the implementation of the principle of subsidiarity, according to which their actions should be limited to the minimum necessary. In accordance with the competition principle applicable in the EU Member States, every activity on the part of public authority in relation to selected undertakings is an unlawful public aid which distorts free competition. The cooperation of local government units with NGOs is an element of implementing their own tasks. When outsourcing the implementation of tasks to non-profit organizations, domestic legal regulations make it possible to circumvent public procurement law. The aim of the paper is to assess whether local government units in outsourcing some of their own tasks to NGOs may in fact be violating the basic principles of the European Union, and whether or not in their accounting for the implementation of tasks local governments observe the principle of sound financial management, in other words, whether it is in compliance with the principles of economy, efficiency and effectiveness in terms of spending public resources. Research methodology: Realizing the aim set, an overview of European and domestic legal acts was carried out, as well as the analysis of reports on public task performance by non-profit organizations with the reports providing the basis for accounting for earmarked grants in two local government units. The analysis of the data contained in the reports was conducted using comparative and indicator-based method. Findings: The analysis of legal determinants shows that it cannot be ruled out that local governments may violate the principle of the free market competition by providing public benefit organizations with earmarked grants. Examining the financial aspect of accounting for grants provided to NGOs, the conclusion to be made is that the practical implementation of the principle of purpose and economy in spending grant resources is not entirely observed. The relationship between the best effect and the costs incurred is not analyzed. Originality of the paper: Highlighting the self-understood in the EU law principles of public spending, reiterated in the Polish legislation, but not sufficiently discussed nor emphasized in Polish literature, including the principles within the scope of grants provided to NGOs. Research implications: The results of the study may find their application in good practices of accounting for earmarked public grants provided to NGOs. Key words: non-governmental organizations, EU directives, local government units. Aim: This paper is devoted to a study of the company’s external and internal factors determining the cost of production. The object of the study is a large industrial enterprise in Russia, Moskoks JSC. The aim of the paper is to analyse the existing cost accounting system of this company, in particular to identify weaknesses of the current system and to provide recommendations for its improvement. Design/research methods: The paper presents classification of costs and cost accounting systems based on the literature study. Then, factors determining the costs of production are analysed within the case study of the cost accounting system based on cost-creating factors in the Moskoks JSC. This allows providing recommendations for such a system. The discussion of results sets them in the wider business context. Conclusions/findings: The analysis of the cost accounting system in operation in the analysed company is performed on the basis of an analysis of cost-creating factors related to the internal company operations and external relations. This analysis revealed the drawbacks of the implemented cost accounting system and led to the formulation of the recommendations regarding the system of accounting and cost planning. Originality/value of the paper: The proposed system based on differential cost accounting meets the need for accurate information about costs of resources necessary to manufacture specific types of products in the analysed company. This approach to cost management can be recommended for similar businesses. Aim: Identification of generational differences in achievement goal orientations and correlations between job satisfaction and loyalty. Research methods: Analyses were based on the author’s own research. The research sample comprised 306 employees, with 57 of them being baby boomers, 124 representing Generation X and 125 Generation Y. Apart from a questionnaire containing questions about satisfaction and loyalty, the survey employed the Achievement Goal Questionnaire (AGQ) developed by Kamila Wojdyło and Sylwiusz Retowski, which draws on Elliot and McGregor’s 2×2 Achievement Goal Framework (Elliot, McGregor 2001). Findings: The findings show that there are no significant differences in the areas in question, which comprised satisfaction, loyalty and dominant intrinsic motivation between the analysed groups of employees. The only noticeable difference was the higher score of baby boomers on the scale of performance-avoidance goal, compared to others. Originality: The originality of the paper involves the application of A. Elliot and H. McGregor’s concept of Achievement Goal Theory in order to verify the actual differences between the selected generations in their approach to tasks appointed to them. Implications of the research: The study is relevant to the practice of human resource management. It clearly debunks the myth of Generation Y and baby boomers as being less interested in self-growth. This finding could also provide an important argument against discriminatory practices in the recruitment process and for fostering employee growth. Limitation of the research: One of the limitations of this study is using a simplified questionnaire for measuring job satisfaction and loyalty. A further limitation is the scope of the survey which did not take into account the differences in competences and approaches to team work or creativity. Aim: In this paper, we investigate attitudes of young people in Poland to road safety. Unfortunately, Poland is one of the EU member states with the poorest road accidents performance. According to official statistics, the majority of road deaths and injuries are caused by young drivers. The goal of the paper is to identify the key elements of the behaviour of young drivers on the road in Poland based on survey research. Design / Research methods: Primary source of data for this work were opinions of young people in the Opole region in Poland. The key instrument of data collection was a pilot survey carried out among people (both drivers and non-drivers) aged 18-24. The survey questionnaire was administrated on 200 respondents, who were selected using random sample technique. 173 correctly fulfilled questionnaires were retrieved. Conclusions / findings: The research findings showed that the majority of respondents usually obeyed traffic rules, however sometimes respondents broke the basic road regulations. The main causes of incorrect road behaviour were the willingness to reach the destination as quick as possible, as well as the irritation caused by the behaviour of other road users. Originality / value of the article: Due to the importance of the problem of road accidents caused by youth in Poland, there are many activities aimed at surveying the attitudes of young drivers towards road behaviour. In this study, we tried to examine road behaviour of both drivers and non-drivers. The assumption was that young people might change their correct road behaviour and attitudes after becoming drivers. Implications of the research (if applicable): The research findings can be a helpful and useful source of information for preparing education programmes devoted to creating an appropriate road behaviour and attitudes not only of young drivers but of young people planning to get their driving license as well. Also, survey results can be helpful while creating tools aimed at addressing and preventing / eliminating key causes of incorrect behaviour of young drivers. Limitations of the research (if applicable): The research was conducted by young scientists from the Students’ Scientific Association Oikos Opole and was focused on randomly selected respondents from the Opole region. It can be a basis for a deeper and larger nation-wide research aimed at identifying more detailed aspects of young drivers’ road behaviour. Keywords: road safety, young drivers, road accidents, traffic regulations. Aim: The main purpose of the article is to make a comparative analysis of the European Union importance in R&D field in comparison to the United States, Japan and China. Design/ Research methods: In the first section, the relation between R&D and socio-economic changes is discussed. In the next part, research and development funding is explored. In the last section, the discussion addresses the following factors: world share of researchers, world share of scientific publications, share of global patents. The main axis of investigation is a comparative analysis, which refers to the international statistical databases: the EUROSTAT, UNESCO and the OECD databases. The study period mainly covered the years 2007 – 2014. Conclusions/Findings: In conclusion it is stated that the EU has the world’s largest share in the number of researchers, as well as in the number of publications. European spending on research and development is not sufficient. Furthermore, the biggest threat to the European Union’s global position in the area of R&D seems to be China, due to unusually dynamic progress in many areas of R&D. Originality / value of the article: The article allows to understand better the international position of the European Union in R&D field. Keywords: research and development sector, R&D funding, European Union. 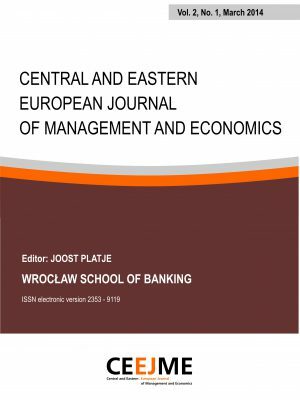 Aim: In this study motivational techniques implemented in Polish and Russian enterprises are compared in terms of current situation in companies operating in post-command economies. The analysis is conducted from the perspective of students – interns of companies both in Russia and Poland. 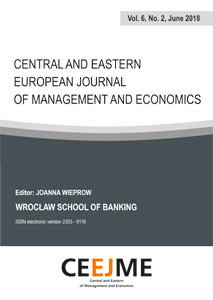 Design / Research methods: In this paper a selection of the most representative motivational techniquesimplemented by enterprises in Poland and Russia are surveyed in order to identify similarities and differences of motivational systems in both countries. The qualitative study can be considered as a pilot survey for an extended comparative analysis of motivational systems in Roland and Russia. The survey was based on interviews with employees and observations conducted by Polish and Russian students in several companies in both countries during study visits and individual internships. Obtained information was analyzed from the perspective of the Millennials and their future employment, so the stress was put on the utilization of positive motivators, financial and non-financial motivational methods. Conclusions / findings: When comparing motivational systems in those two countries, it is observed that in both, negative and positive motivation techniques are used, although in Polish companies negative motivation is utilized less and less frequently, while in Russian companies it is still present. In some enterprises in Russia and Poland financial motivators and negative motivation environment are still considered to be the most effective ones. In both countries such practices become more frequent when economical situation worsen. Originality / value of the article: The comparative analysis of motivational systems in Russia and Poland focuses on objectives and directions adopted and used by companies in both countries for motivational purposes. The paper shows that corporate culture in Polish enterprises is nowadays mature enough, that also non-financial motivators are implemented and bring positive results. It is observed, that all the non-financial motivators are based on the need of participation and appreciation as well as on the need for personal development, which are placed in the middle of Maslow’s pyramid of needs. The study also shows that Russian companies are still at the very beginning of the implementation of such tools in their motivational systems. After reporting research conducted in Russian companies within past 25 years, an analysis of such situation is provided. Keywords: Motivation, incentives, performance improvement, Poland, Russia, organizational culture. Aim: The aim of the paper is to structure the knowledge on the subject of the contract for package travel, package holidays and package tours (further on in the paper a “contract for package”), the obligations of the parties to the contract, and to propose de lege ferenda postulates. The vast majority of authors of scholarly books and publications concerned with the contract for package broaches this topic purely in theoretical terms, and consequently there is no uniform study of this issue which could be used by practitioners of law and consumers. Conclusions/Findings: This paper represents a practical study within the scope of the contract for package, obligations and rights of the parties to the contract and it outlines the problems related to the failure to perform or improper performance of the contract for package. Key words: A contract for package, the legal nature of the contract for package, rights and obligations of customers of travel agencies, obligations of the tour operator, the elements of the contract for package, de lege ferenda postulates. Aim: The paper aims at presenting the issues concerned with barriers and constraints of women’s professional career using a theoretical and empirical approach. 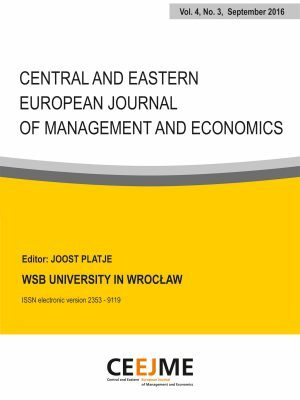 Conclusions/findings: The paper presents results of a survey on women’s professional career conducted on a group of 358 women and men from Silesia province. The survey referred to three areas: barriers and constraints to women’s professional career; female management style, work and private life. The results were analyzed both in the context of general results for the entire group of respondents. On the basis of the results, conclusions were drawn regarding the existing barriers and hindrances to women’s professional career. Key words: career, professional career, women, Silesia Province. Aim: The main aim of the paper is to present the IO-KM model of individual personality-based skills of managers on the basis of practical experiences stemming from procedures for identifying managerial potential over the period of 2000-2015, as well as conceptual and theoretical output on this subject. The authors focus on devising a model of individual managerial skills produced by such factors as personality and temperament determinants, intellect, intelligence and the context of work situation. Among the secondary aims, one should mention an attempt at shedding more light on the categories involving “skills” and “competencies,” including an attempt made at their systematization, as well as presenting experiences in diagnosing managerial skills in selection procedures. Research method: The conceptualization of such categories as “skills”, “competencies”, “director” and “manager” was developed on the basis of the analysis of selected literature. The overview of certain recruitment and selection procedures covered only those studies which kept a complete diagnostic documentation. In the systematization of managerial skills, what was applied were the models of desired managerial skills used in diagnostic research, and the frequency of specific personality components of managerial skills. This provided basis for dividing the skills into individual and group skills against the background of a broader skill model “4-KM”. Here a deductive approach was applied. In presenting the discussion, tabular and graphic forms were used. presented require that basic and in-depth qualitative and quantitative studies be conducted. Originality / value of the paper: The paper contains a review of different positions and interpretations as regards skills and competencies, and the authors’ own proposal within this area. The material, which draws on selected 20 procedures designed to assess managerial potential carried out between 2000-2015, may prove interesting and useful. Of a particular interest is the analysis concerned with how frequently specific components of skills are identified and applied in the assessment of candidates. This was the basis on which a comprehensive model of managerial skills was proposed, as well as the structure of the first of its components – i.e. the IO-KM model of individual personal managerial skills. A detailed investigation and proposals in this respect were combined with Anna Matczak’s general model of social competencies, while seeking to ensure consistency in the perception and examination of managerial skills. Research implications: The comparison of the findings obtained from the review of 20 selection and recruitment procedures may represent a suitable point of reference for a variety of empirical, psychometric and conceptual studies on the issues surrounding worker skills. The comparisons and models demonstrated constitute a convenient conceptual and information framework for conducting in-depth research, for instance, in the field of executive and leadership skills, with such research already being carried out by the authors of this paper. The model proposal presented in the paper still requires to be further verified through the application of quantitative and qualitative tests. Limitations of the research: Within the empirical scope, the research used only 20 selected procedures for identifying managerial potential with a considerable focus given to desirable skills used in the evaluation of candidates. That is why the proposals presented are in their nature open, arbitrary, still requiring a number of empirical, statistical and psychometric tests. The model proposed and its components need to be verified quantitatively, too. Key words: skills, competence, manager, supervisor, managerial potential, the procedure of managerial potential recognition, model of managerial skills. Aim: The main aim of the paper is to test validity of the IO-KM model of individual managerial skills covering personal-temperamental and intellectual skills using the authors’ self-assessment sheet based on the model examined. The secondary aim is to gain more insight into the in-depth validation procedure of the skill model. The authors’ intention is to provide arguments supporting the content validity of the IO-KM model, and ultimately of the comprehensive 4-KM concept. Research method: For building the IO-KM model, empirical material from selected diagnostics procedures was used and as regards the deductive approach the model of social competencies proposed by Anna Matczak was applied. The analyses within this scope allowed the managerial skills to be expressed within the framework of the comprehensive 4-KM model, within which the IO-KM submodel is but one of the components and refers to individual managerial skills of personal nature. For verifying the content validity of the IO-KM model, a preliminary self-assessment sheet of managerial potential, based on the model, was used, which was subject to in-depth psychometric validation. For testing validity, the approach displayed by exploratory and confirmatory factor analyses was used, as well as convergent and discriminant validity. Cronbach’s alfa and Nunnally criterion were used for testing reliability. The discriminatory power of individual components of the IO-KM model was verified using an inter-correlation analysis and Kline criterion. In studying the possibility of normality, the K-S test was used in order to verify the similarities between the distributions of results and theoretical distribution. For the verified version of the IO-KM managerial self-assessment questionnaire, sten and percentile scores were devised. Findings: The separated component of the 4-KM concept was verified in quantitative studies which confirmed the relatively distinctive character of the construct of individual personal-temperamental and intellectual skills in relation to social competencies and individual occupational managerial skills. A set of 10 individual skills contained in the IO-KM model proposed by the authors was tested in terms of structural validity and one-factor, uniform construct was generated. This provided the basis for developing and verifying the final version of the managerial self-assessment questionnaire which satisfies all the basic recommendations in terms of psychometric validity. Originality/value of the paper: The considerations included in the paper are logical continuation of the interests in exploration and systematization of managerial skills. Following the proposal of a comprehensive concept of managerial skills in the form of the 4-KM model, one of its component was devised – the IO-KM submodel, which needed to be verified based on its content. Specific aspects, solutions and findings within this scope are contained in the authors’ earlier paper. In this paper, the IO-KM submodel is subject to in-depth quantitative studies orientated on confirming its content validity. What is interesting and original here is the use of the preliminary self-assessment managerial skill sheet based on the IO-KM model which was subject to detailed validation. What makes the outcome of the research valuable is the development of the final version of a self-assessment sheet which satisfies the basic psychometric requirements. Research implications: The findings of the research on managerial skills bring some interesting prospects for continuing and developing interests related to those issues. On the one hand, it is about further in-depth research on the IO-KM model (e.g. employing other tools for diagnosing skills apart from the self-assessment sheet – observations, decision-making simulations, tests, managerial exercises and other) and on the other hand, it is about building and systematizing in detail the components of managerial skills of the remainder of the comprehensive 4-KM model. Following its development and verification, the self-assessment sheet could be applied more widely by academics and practitioners, producing a source of interesting analytical and comparative material within the scope of issues surrounding broadly-defined worker skills. Research limitations: This paper is concerned with only one of the components of the 4-KM model, while the in-depth quantitative verification was carried out based on the simplified, although thoroughly verified tool of the managerial self-assessment questionnaire. A complete verification of the correctness and cohesiveness of the 4-KM model requires additional and time-consuming studies on the other components of the 4-KM model. One should also observe the IO-KM model in the context of using other measurement tools (besides the self-assessment sheet) in the diagnosis of managerial skills. Key words: managerial skills, 4-KM concept, individual managerial skills, IO-KM model of individual managerial qualifications, validation, accuracy, reliability, power of discrimination, normalization.